The award-winning Norwegian Glacier Museum is next, offering a fascinating insight into the region – from the Ice Age to today's climate change challenges. Afterwards, it's time to see some of the ice formations for ourselves, with stops at the Supphellebreen, Bøyabreen and Kjenndal glaciers. We'll warm up in Loen tonight, where dinner is included. Meals - Breakfast & Dinner. Weather permitting, today we'll begin at Dalsnibba Summit, Europe's highest fjord view. 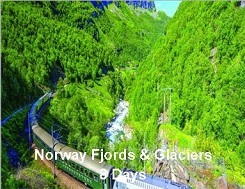 After lunch we'll cruise to the middle of the fjord to see the captivating Seven Sisters, Bridal Veil and Suitor waterfalls. By the end of the day, we'll have sensational photos to share and compare over dinner. Meals - Breakfast & Dinner. On the agenda today: a visit to Briksdal Glacier (with an included troll car ride), followed by a light lunch at a local farm. Then, it's on to Sunnfjord Museum, an open-air museum depicting the daily life of the area's farmer and tenant families in the 19th century. After an insightful day, we'll press on to Høyanger, where the evening will be yours to do as you please. Meals - Breakfast & Lunch. We'll continue our journey with a stop at Vik this morning, where we'll see the richly decorated Hopperstad Stave Church and the distinctive Moahaugane burial mounds. After a stop at the Tvindefossen waterfall, we'll make tracks to Bergen, where we'll enjoy some traditional Norwegian cuisine and toast the final night of our adventure at a local restaurant. Meals - Breakfast & Dinner.